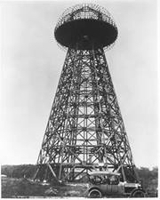 Welcome to our former page for volunteer opportunities at Wardenclyffe! From 2013 to early 2016 we held regular cleanup work sessions that transformed the overgrown former industrial site into an accessible campus. Since then, the focus has shifted to preparing for the restoration of the historic laboratory, the groundwork for a master plan for the entire campus, and an overarching fundraising strategy, including a much-needed renovation of the website and outreach via various campaigns. We will continue to maintain this page and post links to relevant information and opportunities. Meanwhile, if you volunteered in the past, thank you so very much for your contributions. If you are looking for more volunteer opportunities, then we ask for your patience as we explore and develop ways to include volunteers in our new projects. Tesla Wardenclyffe volunteers are "People of the Year 2013"